Authentic Donut Shop Office Coffee - Decaf. Your favorite coffee is now available in decaf! Each box has 42 - 1.5 oz bags of coffee. If you are looking for a great decaf coffee, your search has just ended! 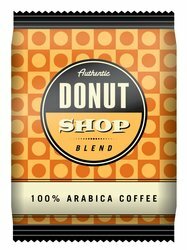 Authentic Donut Shop Coffee includes filters in each case.